ETHNOS was formed in 2013 by musicians who were looking for a platform where they could rehearse improvisational elements and repertoire from different musics they had studied. The group’s founder, Craig Sheffield (who now lives in Taiwan), wanted to explore popular music idioms from other areas of the world and figure out creative ways to incorporate his diverse musical training within rock and pop music formats. Craig was soon joined by other musicians in Austin who were looking to learn more about diverse world music traditions. ETHNOS has always been an ensemble dedicated to musical exploration and collaboration—a place for musicians to share their knowledge of different world music traditions with one another and to experiment with creative combinations of music techniques and repertoire from around the world. As a band that performs music styles and repertoire from several different cultures around the world, one of the biggest issues on the minds of ETHNOS members are the ethical considerations behind using these music practices as the basis of our improvisations. We realize there is a difference between being a student of music versus being a culture-bearer born into a musical and cultural tradition. In the following discussion, we talk about how we navigate some of the ethical issues behind using music practices of “others” as the foundation of our repertoire and improvisation. The biggest ethical dilemma that our ensemble has faced is the idea of earning money by performing music from cultures that are not necessarily our own. There is along history in the Western world of commercial exploitation and “exoticization” of non-Western cultural forms, a practice that infiltrated the music recording industry with the world music craze of the 1980s. Popular musicians and record studios in Europe and America capitalized on Western audiences’ interest in world music forms by collaborating and recording with musicians in other parts of the globe (take Paul Simon’s Graceland or David Byrne’s Rei Momo as examples). Critics would later point out how these collaborations often operated under disparate power relations and resulted in unequal levels of compensation between Western musicians and their collaborators. The original motivation behind ETHNOS was not commercial at all. In fact, early ETHNOS meetings functioned more like a study group where ensemble members could share, rehearse, and improvise with a diverse array of music techniques drawn from various music traditions of the world. Now that the ensemble performs at venues around Austin, ETHNOS members have had to grapple with the ethics behind using the music of “others” to gain economic profit. We’ve dealt with this issue by not treating the music we perform as a product that can be packaged, bought, and sold as a commodity (we don’t sell recordings of our performances, for example). Instead, we conceive of our music-making as a service to engage audiences in learning about and reflecting upon their assumptions of the music of the “other”. Another ethical dilemma that our ensemble members have encountered is the way we represent different music traditions in fusion music. We refer to our music as “fusion” to highlight the multiplicity of our musical influences and identities. But in developing an approach to improvisation by combining features from other music traditions, we realize there is always a risk that we might be essentializing the music of the other to a few distinctive musical characteristics. By essentialization, I mean representing the music of other people by improvising or reproducing characteristic musical features that audiences may identify or stereotype as “Asian,” “Middle Eastern,” or “African.” The problem with essentialization is that perpetuates stereotypes about the music practices of different groups of people, and these stereotypes can be linked with other assumptions about people without allowing for a recognition of diversity that exists within any given culture. In actuality, the music practices of the world are incredibly diverse, and it is problematic to categorize them with broad labels such as “Asian,” “Middle Eastern,” and so forth. Broad labels such as these are social constructions that have been perpetuated by record companies, mass media, and cultural assumptions and stereotypes. With the extent of cross-cultural music exchange, collaboration, and technological meditation that occurs in today’s global society, it is particularly difficult to categorize or label music on the basis of sound alone. Genre labels often have more to do with listeners’ assumptions about musical sound than the actual contexts of the music itself. When ETHNOS started performing around the city of Austin, members were concerned with how we might present these musics in a manner that might lead audiences to engage with their own assumptions about music, genre labels, and categorizations of music practices. We like challenge pre-suppositions about “other” music practices by bringing diverse musical traditions into dialogue with one another. Our improvisations highlight similarities between multiple music traditions and juxtapose seemingly incongruent music practices in our improvisations. Approaching improvisation from this angle inspires new realizations about the relationships between the music practices of the world. We find that as we challenge the boundaries of our own music backgrounds and training in improvisational performance, we simultaneously challenge audience members to rethink their assumptions about music and music categories. One final ethical dilemma that ETHNOS has faced is presenting fusion music in a way that leads audience members to engage with different music traditions in the world on a deeper level. The appeal of world music fusion for Western audiences has often been that it simultaneously represents music practices everywhere and nowhere at the same time. World music draws attention to Western desires to engage with other cultures, but it often isolates the aesthetics of musical sound from the people and cultures who produced it in the first place. World music can sometimes engage with Western imaginings of a generic “other” instead of representing actual people, places, and cultures. ETHNOS members believe it is important that fusion music performance functions as a platform for audiences to learn about music traditions and the different ways that music is conceived around the world. The group’s founder, Craig Sheffield, was passionate about providing audience members with explanations about the music the group was playing. He would often translate the lyrics of songs for the audience, explain which areas of the world the music was from, talk about the composers of the repertoire, and mention the types of musical devices that audiences members could listen for during the performance. Craig’s desire to share information about different music practices with new audiences remains an important initiative in ETHNOS’ projects and performances today. ETHNOS strives to provide a platform to engage with different music practices in a way that is accessible, inclusive, and appealing to audience members. 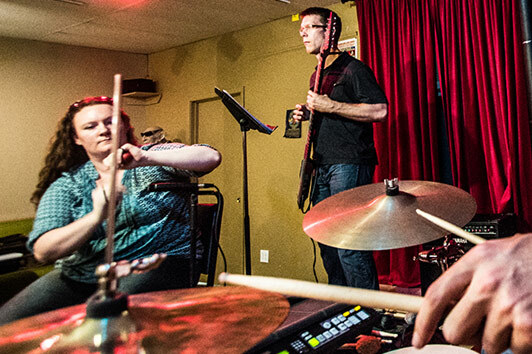 From humble beginnings in small rehearsal rooms and coffee-shop spaces, the ensemble has diversified into providing workshops and clinics for music organizations and schools in Austin. In these lecture-performance formats, we provide an interactive platform for audiences to conceive of music in different ways. And we try as much as possible to relate our music to specific places and people by contextualizing the musical devices that we are using for the basis of our improvisations. This blog was written by Myranda Harris, a percussionist and member of the band ETHNOS. We appreciate your feedback in the comments section below. Please help spread the word about our thoughts on ethics and fusion music by sharing and liking this article. Eloquently explained and I hope to see your ideas continued to be shared and cherished for their intent as you have done me such a great honor in even mentioning myself in this pursuit. Best of luck and I hope to join you again soon!